The Alley Theatre stage was recently the setting for an array of musical talent from across the new council area, with a special showcase of work from participants in the Music to your Ears programme. 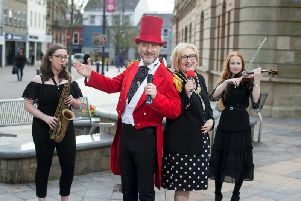 The musical extravaganza was opened by Deputy Mayor of Derry and Strabane, Councillor Thomas Kerrigan, and was the highlight of the project which was developed through the Arts Councils Arts and Older People’s programme. The Music to your Ears programme is geared towards men over the age of 55 and all those taking part were absolute beginners just nine weeks ago. Over that time they have been developing their talents under the expert guidance of Mickey Joe Harte, Terry McCafferty and a number of guest musicians. The programme aimed to get them engaged in the arts by developing new skills and boosting confidence, in turn helping to improve their general health and well-being. The showcase event was guided smoothly by MC Tommy Forbes, who wove the story between the various acts from the Rock Ramblers Accordion Band to the newly developed songs and poems by Jim Hunter. All the superb singers and performers on stage were ably supported by veteran musicians, ensuring a great evening’s entertainment for all. Guest singer Art O’Hagan stole the show with a number of songs performed at the spritely age of ninety! Leading the Arts and Older Peoples programme on behalf of Derry City and Strabane District Council, Arts Development Officer Jean Smyth, said: “The music project has been a fantastic success and on Wednesday the programme turned its attentions to traditional crafts, with men from the Strabane/Lifford Resource Centre starting a beginner’s metalwork course with artist Eamonn Higgins on his mobile forge in the Alley courtyard. The group learned how to manipulate metal using heat and hammering over a blacksmith’s anvil to create a personalised decorative product each. Funding for this project was secured through the lead partner Arts Council of Northern Ireland under their Arts and Older Peoples Programme which is jointed funded by Arts Council of Northern Ireland, Dept. of Culture, Arts and Leisure, Public Health Agency and the Baring Foundation. These workshops are currently taking place in both Strabane and Derry and there are still a limited number of places available. For further information on the project contact Jean Smyth, for Derry City and Strabane District Council via the Alley Theatre on 028 71384444, or phone 07730900610.